It’s evening story time and as your child reads through a new book she suddenly comes to a difficult word and stops. What do you do? Do you give her the word? Or do you say “sound it out”? Many teachers are beginning to realize that, although “sound it out” often comes to their lips, it isn’t necessarily the best response. The English language is not consistently phonetic so it is not helpful, or even fair, to tell a child to “sound out” words like said, night, or know, just to cite a few familiar examples. A better strategy is to give your child a little support by saying, “Hmm, what would make sense there?” or point to the picture. Sometimes encouraging the child to go back and reread the sentence from the beginning helps as well. It’s important for story time to remain stress-free, so if your child is getting frustrated by too many unfamiliar words, just give her the word or read the entire book to her. My child memorizes books, instead of reading them. Is this OK? This is not unusual for very young readers, but we don’t want them to get the wrong impression about reading. We want children to understand that reading is not about memorizing books or lists of words, but rather about making the story make sense. Figuring out the words, attending to the print, and making the sentence make sense are all part of reading. If you run into this problem, maybe your child is ready to move on to books where the pattern changes. It is OK for her to do some real work while reading. My child seems to know a word one day, but then she forgets it the next day. Should I put the words on cards and drill her on them? Kids need to see the same words many times in a variety of settings to get to know that word. It’s better for her to see a word in an actual book than on flash cards, out of context. She may come to think that reading is just about accurately calling the words and not about understanding the full story or book. It’s normal for beginning readers to have words that are only ‘partially known.’ The more they encounter those words in authentic reading and writing situations, the more familiar the words will become. Eventually those words will become fully known and instantly recognized. Should I give my child prizes for every book she reads? It is great to encourage a child to read more, but reading should be its own reward. When we offer kids pizza or stickers for reading a certain number of books, we are actually sending a message that reading is something unpleasant so we have to resort to prizes to get them to read. Also, when kids are counting the number of books they read in a race for a prize, they often sacrifice quality for quantity. When you take your child to the library or a bookstore, spend some time finding books she enjoys. Ask her what she wants to learn more about or what kind of books she likes to read. 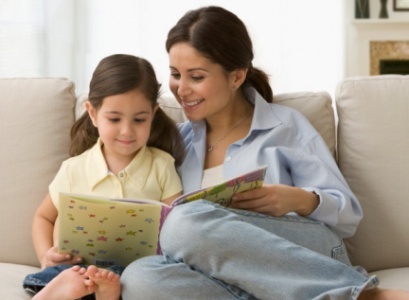 Make a special time each evening for you and your child to sit down and read together. How do I know my child understands what she’s reading? What should I do when she finishes a book? If my child is struggling with reading, should I take her to one of those learning centers or buy a kit to teach her how to read? Talk to your child’s teacher if you think she is struggling. Learning centers and expensive computer programs might help your child pass a test, but they won’t help her build good reading strategies in the long run. A reading tutor who can support what is going on in the classroom and work together with your child’s teacher is a much better option. Note: If you are a teacher reading this post, feel free to duplicate it to use in one of your parent newsletters or to give out at parent conference time. Also look in Chapter 11 of Catching Readers Before They Fall for more Q/A for families. Sometime in the first month of school you can expect to have a Back-to-School night for parents. I remember always freaking out about all the things I wanted to be sure to tell the parents or guardians, but now I realize that too much information just overwhelms them. As a parent myself, I now realize that the parents come that night to find out what kind of person I am. Will I keep their child safe and support him as a learner? Will I love their child and find out his strengths and weaknesses? Am I a kind and caring individual? Do I have a structure and organization to the classroom that will allow for guided learning as well as individual creativity? Do I seem knowledgeable about the curriculum for this grade level? Our many years of experience have taught us that as the school year progresses there will be various opportunities to communicate with the parents and we don’t have to “get it all in” on this one evening. Below we make five suggestions of what we like to get across to our children’s families on Back-to-School night. We will accept their child exactly as he or she is. We will work hard to understand the strengths that their child brings to the group. We believe in developing a community of learners who work together cooperatively and support each other. Much of what we do in Social Studies and Science is inquiry-based learning. As we begin projects, students have opportunity to ask questions about what they would like to know about the topic. A weekly newsletter will keep you abreast of what we are working on. The walls of our classrooms and outside in the hallways tell the story of our learning together. Please feel free to come in and have a look. We believe in taking each child from where he is and helping him grow as a reader, writer, mathematician, artist, and so on. We want to develop children who not only CAN read and write, but LOVE to read and write. We promise that the children will fall in love with certain books and authors this year. Look for the titles of our read aloud books in the newsletter. In Catching Readers Before They Fall, Katie talks about the weekly newsletter on page 213. See a sample of her Keier Flyer in Appendix 19 and her first letter home to parents in Appendix 17. Also, Chapter 11 answers questions commonly asked by parents throughout the school year. We hope you will add an idea of what you share with parents on this special evening.